The head office of Stadtsparkasse Mönchengladbach was built about 26 years ago on the Bismarckplatz in Moenchengladbach. In addition to the modernization, the goal was for more customer related areas on the ground floor. 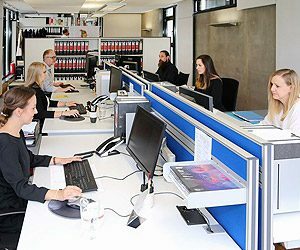 The architects of KRANZ created a new, open and clear structure that enables high discretion despite the fact that the customer can see the employees in their Team Areas. The architects have ensured that no unpleasant “crowd capacity atmosphere” arises. Consultation takes place in non personalized consulting rooms. A red viaduct connects the SB zone with the service on one side, to the spacious customer hall with the reception area on the other side. The interplay of real wood flooring in the centre of the customer hall with adjoining concrete look and carpeting, optimizes the orientation for the customer. In this building which was originally built in 1956 there has only been one renovation, and that was in 1973. The branch building was completely gutted down to the bare floor by KRANZ, and then reconstructed with a new self service area. The rooms being of varying shapes and heights, combined with the many support columns, posed an architectual challenge for the architects. 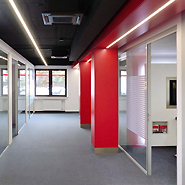 The columns were integrated into the new room concept using coloured wall panels in red and white, this cleverly complementing the new room concept. From one of the columns a white sail sretches across the ceiling and transforms the whole room visually, taking away the supporting effect of the column. The differing ceiling heights was cleverly mastered by painting the walls black, all at a uniform height, thus making the illusion complete. The non personalized consulting rooms are designed in a self-sufficient room-in-room system. KRANZ Architects have succeeded in an architectural competition with their concept of modernity, transparency and optimal customer engagement. The conversion which cost almost 9.4 million € was carried out whilst business was still going on its daily routine. The idea was to bring all the various financial services, which up to now were running in various parts of the building, under one roof, reconfigurating all the offices and therefore optimizing the use of all the available space. By doing this the combination of non personalized consulting rooms and team rooms in conjunction with the functional available space was efficiently optimized. 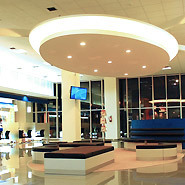 In the centre of the building, is a staircase which has been built like a sculpture, ” a welcoming gesture”, navigates the customers to the consulting world on the upper floor.The reception area is part of a multimedial marketplace, the “Avenue of Wishes”. This avenue is the heart of the branch, from here all areas are interconnected with one another. In addition to multimedial productions, regional companies, institutions, & Partners can display their products. 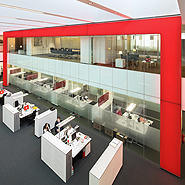 KRANZ Architects also developed a “Master Design” for the Sparkasse Düren. This is a somewhat extensive facelifting of the branch Kreuzau where some “Master Design” components have been successfully tested in a pilot project. 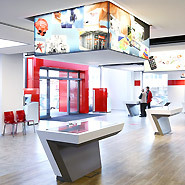 In the S-Corner, the new Young Banking branch of the Sparkasse in Lübeck, the young people are here in the spotlight. The financial institution would like to appeal more to students, apprentices and job-seekers. 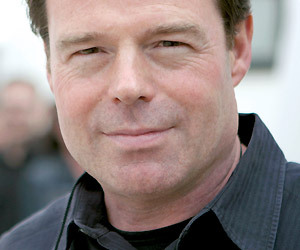 With an unusual and innovative appearance it is hoped that this will attract the attentionof the young people. This task was entrusted to Sparkassen KRANZ Architects who had already designed the S-Spot in Göttingen in 2013, and the S-Campus in Kassel in 2016, also having redesigned the neighboring headquarters of the Sparkasse in Lübeck. The design is reminiscent of the ambiance of modern fashion labels. The work of a scene painters painted clinker brickwork, which reflects the Hanseatic architecture in Lübeck and stands in contrast to the the mastic asphalt, which is reminiscent of the industrialisation, all this in a fascinating optical dialogue with the high gloss lacquered red ceiling sails, glass and concrete optics of the consulting furniture. 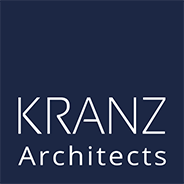 The existing buildings which were in need of renovation were completely demolished and then rebuilt by Kranz Interior Architects using an adapted and changed environment. 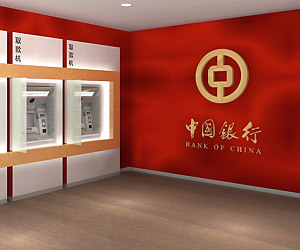 The new branch design was then built using the “flexible branch” concept. This concept is a development of Kranz Interior Architects and is based on the many years of experience of our office, shop and exhibition construction. 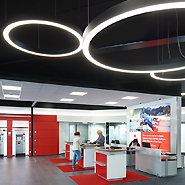 In conjunction with high quality standards, the new branch design of the Sparkasse Fulda visualizes the almost showroom like offered products and financial services which are presented modern, moving with the times, & future oriented. The original building was completely redeveloped by Kranz Interior Architects. 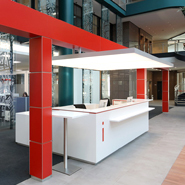 The highly flexible work and store concept developed by Kranz for the Sparkasse Fulda is more than just a room-in-room system, it is a design concept which reacts to all conceivable changes way into the future. 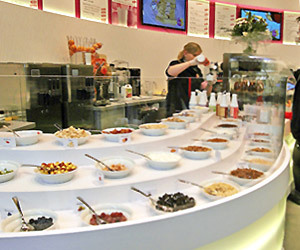 A clear spatial structure necessary for this concept optimizes the orientation of the customer and thus almost automatically creates a new proximity to the customer. It seems to us as if no other method of construction is as meaningful today, whether in the design of offices, or in the design of shops, and most definately not in the branch design. The building, which was built in the 60s and is the headquarters of the Sparkasse, consists of two buildings, a 10 storey high-rise building and a 2 storey base building. In a three year period the building has been completely redeveloped in 3 phases. First, the office tower was completely gutted, redesigned and fitted with a new aluminum and glass façade. After this was completed the base building was remodernised with a customer entrance hall, meeting rooms, employees casino and board area. 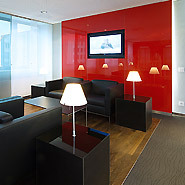 The Goettingen architect firm of KRANZ Architects were commissioned for the interior design. 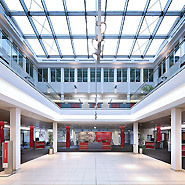 A ceiling high “Gate” (changeable light colour) determines the spatial impression of the entrance hall and optically combines the working places of the bank employees on the ground floor with the conference rooms of the management above. “We want that the employees of the savings bank are visible,” said Kranz, “but that they are able to work undisturbed”. 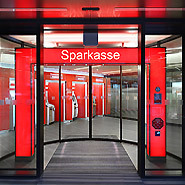 The gate gives an optical signal for the customers to show them that the Sparkasse is available for them in every area. The “everything and everywhere” philosophy determines the communication behavior of customers everywhere. “Omni-Channel strategies” are changing the market dramatically.Business models, sales strategies and products of banks and savings banks will change faster in the future. The answer can only be a branch type, which is highly flexible and which can be quickly dismatled. KRANZ has developed for KSK Köln a branch type which is modular and quickly changeable, a kind of “space in room ” solution, regardless of the given building, it can be dismantled and rebuilt elsewhere. Simple, inexpensive design principles from the store design are used to create a high-quality yet welcoming atmosphere where the consultations take place in a homely atmosphere and reasonable discretion. These consultation rooms are fully equipped and independent of ceilings, walls or varying building facades. Throughout the branch floor sockets are unnecessary, the electric supply is in the ceiling and is therefore highly flexible and inexpensive in dismantling. 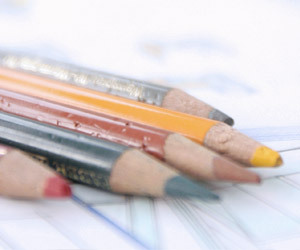 Pictures, images, colours and materials make up an identity oriented brand communication with an atmospheric effect. 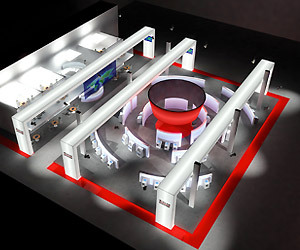 In just one and a half years KRANZ developed, in close cooperation with a selected project team of KSK Köln, the new branch design. Since the end of October 2014, a prototype of the technical and architectural innovations is being tested for its suitability for everyday use in St. Augustin. The new concept is since 2015 in rollout. From the entrance, the customer becomes a direct view to the service of the Self-Service Area in the first zone. The second zone is between the Service and Self-Service Area, a wide boulevard where the innovative furniture stands, drawing the customers attention. The customer is now taken through to the touch enabled communication tables and multimedial area, a self participation experience is offered here. Moving images and visual effects serve as a medium to arouse the intrest and initiative of the client. This makes the customer more willing to desire a direct conversation which would inevitably lead to a consultation. On the way to 3.Zone, the service area, and back to the entrance, the customer must then go back through the Boulevard, making a lasting positive impression. 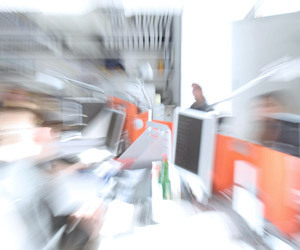 This perfect interaction between media and architecture makes the products and services of the Sparkasse Rhein-Nahe an unforgettable experience. 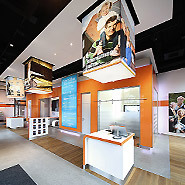 The third zone is ultimately the classic Service Area, here is where the customer is greeted at each desk by the staff, who are otherwise visible at work at their desks in the background. The new “Haus der Mitglieder” (“Members House”) on the Kennedydamm in Hildesheim is unique. The organizational form of the “Volksbank Genossenschaftsbank” (Volksbank cooperative bank) is also expressed in the design of the building. After more than 35 years, the main branch of the Volksbank no longer meets today’s energy requirements, this has made it essential to modernize the existing building. KRANZ Architects utilized simple, solid materials which, by their combination – matt and shiny – accentuated the design establishing a strong expression. The perfect interplay between media and architecture allows customers to orientate for themselves independently amidst various financial topics. 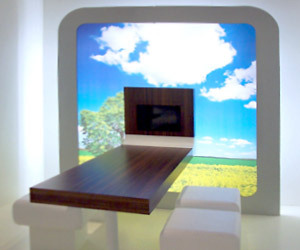 In “Wunschwelten”(“Ideal Worlds”), they can use interactive multimedia stations and at ease experiment with their ideas and wishes, playfully put together ideas and goals to a wishlist and finally discuss the realisation of their wishes in a conversation with a consultant. Responding to the wants of the young banking school pupils, apprentices, students and young professionals under 25 years. A generation that has grown up with multimedia, internet, iPhone and laptops, they feel at home between modern technology. For the ambiance, which enables uncomplicated financial services negotiations, KRANZ Architects took design principles from the shop design, shop fitting and gastronomy. Instead of the typical “savings bank flair”, here is a young, dynamic design language in the forefront. Open, transparent and multimedial, this is how the interior designers of KRANZ Architects redesigned the main office of the BMCE Bank in Casablanca. A modern and spacious banking hall was created by demolishing a staircase, set into scene with warm colours and dramatic lighting, presenting the customer a contemporary appearance. The local reference of the BMCE Bank becomes clear with the use of Moroccan Geometric Ornaments that are incorporated in the design. After the design and planning through KRANZ Architects, the reconstruction was realized exclusively with local traders and materials. 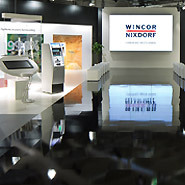 Headquartered in Paderborn, the globally active company Wincor Nixdorf holds the “Wincor World” annually, a showcase on 8.000 m², presented are here on only three days to approximately 8.500 international visitors the latest products, solutions and trends of the company. The challenge for the KRANZ Architects was to present new products perfectly in a given budget, and at a low cost being able to create a temporary but always changing new World, this they have achieved in an impressive manner ever since the first Wincor World 1998 . On the former factory site of the Phoenix works in Hildesheim, a new district with shops and apartments was built. 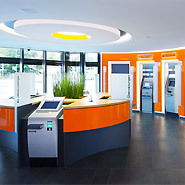 In the new building in which the style was influenced by the factory design, a 120 sqm large & elongated branch was provided for the Volksbank Hildesheim. “We bring into the design of bank branches our international perspective and our experience with shop concepts, often resulting in a refreshingly new approach,” says architect Andreas Kranz. In fact design principles which are used in store design play a great role in the conception of this branch. Black ceilings with visible technology, flexibly deployable spot lights, acoustically effective ceiling panels with interchangeable motif modules and an industrial seamless flooring add to the design. On the “Boulevard of Wishes”, a reversible, double bottomed real oak planking can be flexibly installed at any location to facilitate all action and dialogue furniture. The heritage protected building of the main branch of the Sparkasse Bielefeld, has been completely redeveloped by KRANZ Architects in just 13 months. The newly created entrance for the building, designed by KRANZ Architects, was particularly praised by the Advisory Board for Urban Design of the City of Bielefeld. 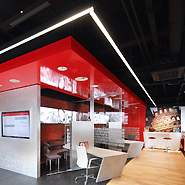 A 40 m long ceiling light panel will help the customer from the outer region into the service area inside the building. 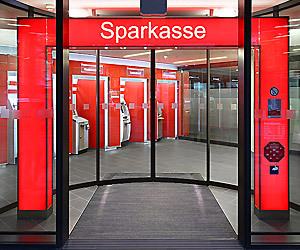 Advertising and optimally displaying the brand name, image transfer and self representation of the Sparkasse Bielefeld, works from the inside to the outside and is created simply by replacing the motifs in a 3 month interval, a forever changing appearance. With the demolition of a 200 sqm large patio on the 1st floor and a newly created glass roof over it, KRANZ Architects have brought daylight into the building and avoided a costly energy saving renovation of the patio. For the new executive area a portion of the third floor was completely refurbished by KRANZ Architects. The newly created access to the boardrooms are situated opposite to each other and form a diagonal square, a kind of meeting place. Floor, ceiling and lighting highlight these areas visually and avoid the impression of long corridors. Not bulky and ornate, the interior designers from KRANZ Architects have used different materials such as precious woods and textures, with smooth, glossy or matt surfaces, to give a feeling of quality and valence with outstanding success. KRANZ Architects developed specifically a Master concept for the BCA that includes modular requirements which were refined to accommodate the cultural needs. 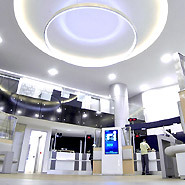 From the spacious waiting area, over counter and consulting areas, to the queueing system and the superior designed Prioritas level, all sections of the BCA were conceptually redeveloped and using this single master design enabling thus the implementation for all future branches. The Click & Mortar branches are open multimedia branches in shopping malls, with the latest technology and self-service expertise in the foreground. The principles that are used in the branch design also played a formative role in the conception of this branch type – black ceiling, flexible spotlights on rail systems and a blue coloured industrial screed. The products of the Bank were made both “touchable” and visual. The individual multimedia service options, from video banking, telephone banking to interactive touch terminal are visually summarized by the blue bracket and made visually evident by the motifs above the service stations for the customer. 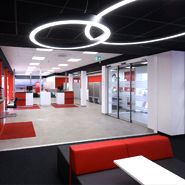 Remodeling and redesigning the second largest branch of the Sparkasse Fulda. 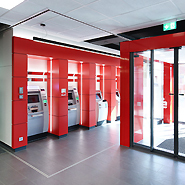 The original building of the Sparkasse Fulda has been completely refurbished and the size being reduced due to the requirements of this savings bank. Using the new transparent space concept from KRANZ Architects, the interior designers were able to create an optimal view and view relation between self-service and service areas. 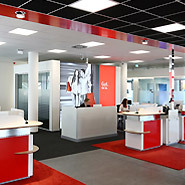 The new floor and ceiling design navigates the customer through the self-service area into the service area. 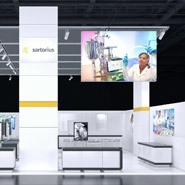 The Sartorius AG International Exhibition Booth Design developed by KRANZ Architects characterizes the mission of the Sartorius company. This design characteristic is also to be found in the new showroom at the Sartorius College in Goettingen as well as in the new reception area in the HQ. The product portfolios available in the showroom underline the claim to the quality of the Sartorius company. 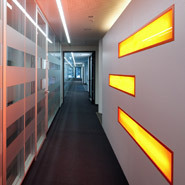 The new redesigned entrance and reception area are the visiting card of the Sartorius AG. Open, transparent and service oriented, this is how KRANZ Architects redesigned the main branch of the Sparkasse Marburg-Biedenkopf in Marburg. After the demolition of the huge, 50m long concrete roof, a new glass covered facade and a spacious entrance were created along its entire complete length. 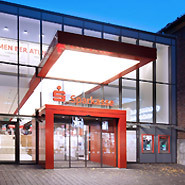 Advertising and optimally displaying the brand name, image transfer and self representation of the Sparkasse Marburg-Biedenkopf, works from the inside to the outside and invites the passers-by on the University road to enter the bank. Once entering the branch just one glance shows the self-service area, and the consultation area. The demolition of a 180 sqm floor area of a patio on the 1st floor and this coupled with a new large area glass roof on the 4th floor, KRANZ Architects have succeeded in avoiding a costly energy saving renovation of the facade and courtyard to bring a glare-free daylight into all rooms. The construction of the main branch of the Volksbank Paderborn-Hoexter-Detmold in the new City Centre of Paderborn extends over 5 floors. From the service area, a staff lounge, the counseling centre and the executive area, it bears the stamp of KRANZ Architects, which is clearly visible for all to see. Design language, the world of materials and the illumination concept are implemented consistently throughout the whole building, and characterizes the image of the company.